Sports-Fitness-Solutions Newsletter, Issue #028--INACTIVE, LAZY, A COUCH POTATOE, IS THAT YOU! INACTIVE, LAZY, A COUCH POTATOE, IS THAT YOU! Are you inactive, lazy, or a couch potatoe? Or do you know one? You know, people who would rather spend the day planted on their couch than anywhere else; and to whom the term "workout" is a dirty word? I'm sure you do. Hopefully it's not you. Sure, I know that we all have our occasional lazy day on the couch, and it can be good for you occasionally; however recently I've seen more and more people are turning laziness into a "national passtime." You'd rather be a passive observer than an active participant. You've got an excuse everytime the idea of physcal activity comes to the fore front. You find ways around doing anything physical, especially working out. 1. Sleep Deprivation: When you're short on sleep it's easy to become unmotivated, which quickly turns into laziness. Get a minimum of 7 - 8 hours of sleep each night in order to maintain enough energy to get you through the day. Some experts even say that 10 hours of sleep each night is what you need to function at your best. 2. Caffeine Abuse: Starting your day with a great cup of coffee may help you start your day and help you to be alert first thing in morning, but the dip in energy that takes place a few hours later could be the reason that you become lazy later in the day. Avoid or limit caffeine and instead, rely on your steady supply of natural energy. 3. Bad Habit: At some point being lazy simply becomes a habit. For example, if every night you head straight to the couch, it soon becomes automatic and not a conscious action. Breaking the habit of laziness is actually quite easy. Simply take yourself off autopilot and make the conscious decision to do something productive instead - like heading to the gym rather than the couch. 4. Inactivity: If your job keeps you in a chair for hours at a time, and you don't exercise when off the clock, then your body is just accustomed to inactivity. It's time to wake up your under-used muscles and to reacquaint yourself with the joy of motion. A simple way to get back into the swing of things is to go on a 30 to 60 minute walk either before work or after you return home. Once you've broken yourself in with consistent walks, contact me to get started on a fitness program that will quickly get your body back into great shape. So let me ask you, "Is today the day that you kick the laziness habit? Is today the day that you will listen to your voice of reason, telling it's time to get active? Take a moment and imagine the you you want to be. What does the 'ideal you' look like? How does the 'ideal you' spend their time? Who would the 'ideal you' spend time with? What would the 'ideal you' accomplish? When faced with decisions, big or small, do what your 'ideal you' would do, rather than taking the easy way out. If you need help getting there, contact me and let me help. You can do it, we all can. I love pasta, and I recently found this great recipe using pasta and turkey. Here is a guiltless way to prepare spaghetti that the whole family will love. 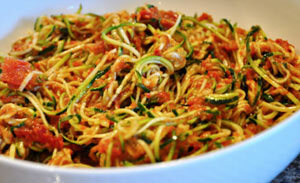 To create angel hair noodles out of zucchini you simply need a small kitchen gadget called a spiral slicer. This ingenious tool is inexpensive, and with it you'll quickly and easily make delicious fiber-filled noodles. 1. Place the spiral-sliced zucchini in a large bowl and set aside. 2. In a medium sized skillet heat the oil. Add the onion and garlic and sauté until soft. 3. Add the turkey to the skillet and cook until fully browned. Add the spaghetti sauce and mix until fully incorporated. Remove from heat. 4. Mix the sauce with the zucchini noodles in the large bowl and serve.